It’s the Daily Diana, and the Sun leads with Sun readers remembering the day Princess Diana died 20 years ago. 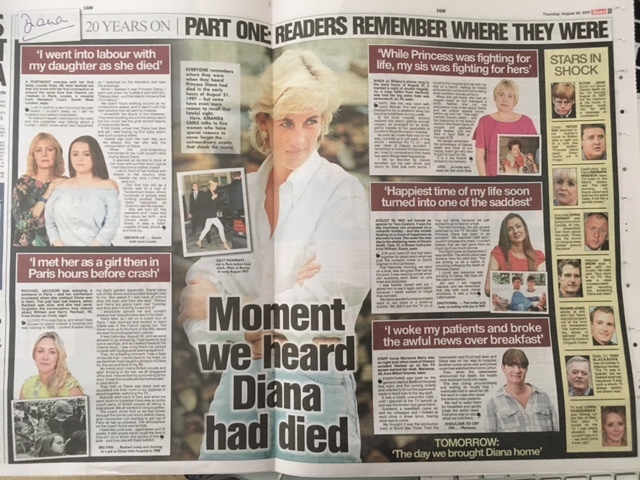 The story is headlined “Diana AND ME”. Because it’s all about ME. “Gracie was born the next day, and we always told her she was the reincarnation of Diana,” says Louise. Although Diana wasn’t dead yet, and only soap actors get to be the reincarnation of someone still alive. It detracts little from the drama to note that Louise never met Diana – well, not in her previous lifetime. Tess agreed to marry her boyfriend the day before news of Diana’s death broke. She says the day was a “true rollercoaster”.